A facelift, also called a rhytidectomy, is a surgery that improves the visible signs of aging in the face and neck for a more youthful appearance. Why do people choose a facelift? With age, many people feel that the signs of aging on their face and neck do not reflect the youthfulness that they feel inside. 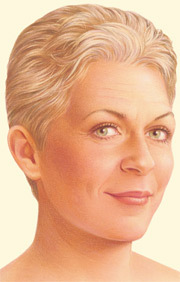 These issues may include a combination of sagging in the mid-face, deep creases below the lower eyelids or extending from the nose to the mouth, fallen or displaced fat, or loss of muscle tone in the lower face creating “jowls.” For some, loose skin or excess fat collects under the chin, which can create a “double chin” appearance even in those of normal weight. A facelift may be performed alone or in conjunction with a brow lift to correct a sagging or deeply furrowed brow in addition to eyelid surgery. In addition, if necessary a midface lift may be indicated to lift the fallen tissues of the sagging midface. Dr. Armenta will discuss all of the possible procedures that may be indicated in your surgery and is happy to answer all questions that you may have about how to correct any aspect of your face and neck that you feel needs a lift. Depending on the degree of change you would like to see, your rhytidectomy surgery could include a traditional facelift, limited incision facelift or a neck lift. 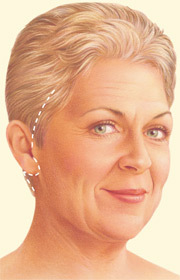 In a traditional facelift, incisions are made from the hairline extending around the ears to the lower scalp. Another option requires only limited, shorter incisions at the temple area and ears. Depending on needs, incisions may also be made under the chin, eyelids or under the upper lip. Once incisions are made, fat can be removed, sculpted, or redistributed to areas of need and muscles are lifted and tightened as necessary. The skin is then re-draped over the tightened muscles and the excess is removed. Sutures are then used to close all incisions in a very meticulous and careful manner. Once healed, the incision lines from a facelift are well concealed within the hairline and in the natural contours of the face and ear. 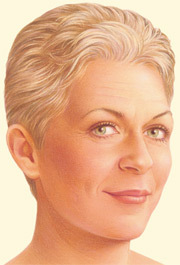 A facelift can offer patients a more youthful and rested appearance. In addition to a new look, many people will enjoy a better self-image and more self-confidence. While a facelift does not stop the future aging process, a healthy lifestyle and life long sun protection will help maintain the long lasting results from a facelift. How can I learn if a facelift is right for me? If you’d like to make an appointment for a consultation to learn whether a facelift is right for you contact Dr. Art Armenta’s office. Dr. Art Armenta is a Diplomat and certified by the American Board of Plastic Surgery and is a member of the American Society of Plastic Surgery.